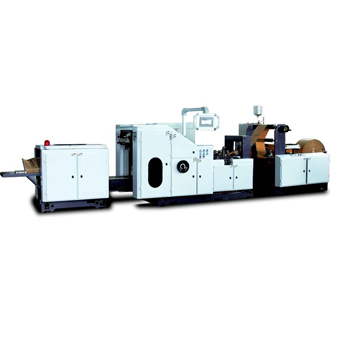 Automatic Paper Bag Making Machine applications for making square bottom paper bag from blank or pre-printed paper roll. 1. With Yaskawa PLC & MCGS touch panel HMI to preset working parameters. 2. With Yaskawa Servo Motor for cutting length control and Frequency Inverter for material feeding,with high precision and stable working. 3. With Automatic Hydraulic Lifting System to load heavy jumbo roll onto unwind shaft,save labor and loading time. 4. With Magnetic Powder Brake for unwind tension control to keep constant tension when machine works. 5. With PLC for central control system and SICK photocell for coreection to track printed material accurately,save adjusting and preset time,so that improve production efficiency. 6. With safety cover to make sure operator'ssafety when machine works. 7. All the rollers have been dynamic/static balance treatment. 8. Electricity is strict comply with CE certification. 5. With automatic counting device.Envelope quantity can be preset before machine running.